UNITED NATIONS, Mar 19 2015 (IPS) - The growing economic inequalities between rich and poor – and the lopsided concentration of wealth and power in the hands of the world’s one percent – are undermining international efforts to fight global poverty, environmental degradation and social injustice, according to a civil society alliance. The group identifies a list of key concerns – including tax avoidance, wealth inequality and lack of access to healthcare – as being unduly influenced by the world’s wealthiest one percent. “Securing a just and sustainable world means challenging the power of the one percent,” the group says. The signatories include Adriano Campolina of ActionAid, Dhananjayan Sriskandarajah of Civicus, Kumi Naidoo of Greenpeace and Winnie Byanyima of Oxfam. Asked about the impact of economic inequalities on the implementation of the U.N.’s highly touted Millennium Development Goals (MDGs), Ben Phillips, campaigns and policy director at ActionAid International, told IPS economic inequalities have meant that in many countries progress on poverty reduction has been much slower than it would have been if growth had been more equal. For example, he said, Zambia has moved from being a poor country (officially) to being (officially) middle income. Yet during that time the absolute number of poor people has increased. India’s persistently high child malnutrition rate and South Africa’s persistently high mortality rate are functions of an insufficient focus on inequality, he added. Papua New Guinea has the highest growth in the world this year and won’t meet any MDG, because the proceeds of growth are so unequally shared, he pointed out. Speaking on behalf of the civil society alliance, Phillips said inequality has also been the great blind spot of the MDGs – even when countries have met the MDGs they have often done so in a way that has left behind the poorest people – so goals like reducing maternal and infant mortality have been met in several countries in ways that have left those at the bottom of the pile with little or no improvement. The statement also says that global efforts to end poverty and marginalisation, advance women’s rights, defend the environment, protect human rights, and promote fair and dignified employment are all being undermined as a consequence of the concentration of wealth and power in the hands of a few. “Decisions are being shaped in the narrow interests of the richest, at the expense of the people as a whole,” it says. “The economic, ecological and human rights crises we face are intertwined and reinforcing. The influence of the one percent has increased, is increasing, and ought to be diminished,” the group warns. “Faced with this challenge, we need to go beyond tinkering, and address the structural causes of inequality: we cannot rely on technological fixes – there is no app for this; we cannot rely on the market – unchecked it will worsen inequality and climate change; and we cannot rely on the global elites – left alone they will continue to reinforce the structures and approaches that have led to where we are”. 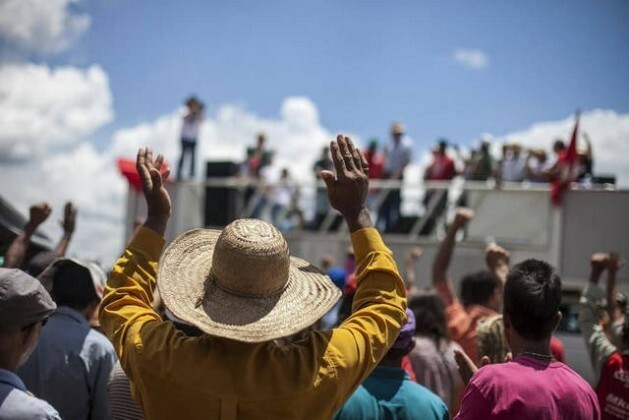 People’s mobilisation and active citizenship are crucial to change the power inequalities that are leading to worsening rights violations and inequality, the group says. However, in all regions of the world, the more people mobilise to defend their rights, the more the civic and political space is being curtailed by repressive action defending the privileged. Phillips told IPS even the U.N.’s proposed Sustainable Development Goals (SDGs), to be approved at a summit meeting of world leaders in September, will not be achievable if economic inequalities continue. As leading economist Andy Sumner of King’s College, London has demonstrated, “we find in our number-crunching that poverty can only be ended if inequality falls.” Additionally, healthy, liveable societies depend on government action to limit inequality. Phillips said tackling inequality is core to progress on tackling poverty – both because extreme and growing economic inequality will undermine poverty reduction and because the warping of power towards the one percent is shifting the focus of governments away from their citizens and towards corporations. “Inequality is about more than economics and growth – it is now at such high levels that we risk a return to the oligarchy of the gilded age. We need to shift power away from the one percent and towards the rest of society, to prevent all decisions being made in the narrow interests of a privileged few,” he declared. “wealth” is relative — you can go to any rural village and they would be the one who own the fishing boats & equipments, operators of the few land transport, the “biggest” house, the local politician/landed/ entrepreneur etc whose “wealth” is defined as having more of this and that than the “subsistence or little” that everyone has…constituting the reviled “local rich/wealthy ”. In ref to the adage “knowledge is power”, again – one can count how many of the world’s population are considered knowledgeable (with understanding of the depths & scope of inequality) — who could enable/facilitate etc “help strengthen the power of the people to challenge the people with power”. And who are they? I think they would be constituted from those in-between the rich and the poor. And from the same are likewise those who constitute the executors & enablers of the tools/machineries of power that effect “global poverty, environmental degradation, social injustice…the imbalance of the power…warp the rules and policies that affect society…create the vicious cycle of ever growing and harmful undue influence….” If the spectre of the “ a return to the oligarchy of the gilded age” is ominous … what exactly does history say about what brought it down/transformed the balance of power in the first place? Do existing conditions contrive if not forbode for history to repeat itself? What about the “missing middle” between the “rich and the poor”? Do they exist or do they even matter at all? Where and how do they feature in all these? Are they who i think they are? Well run cooperatives can be part of the solution as they can more fairly distrubute profits. They are present in 146 countries, have 1 billion memberships and $3 trillion in annual turnover worldwide. They need to be at the table.